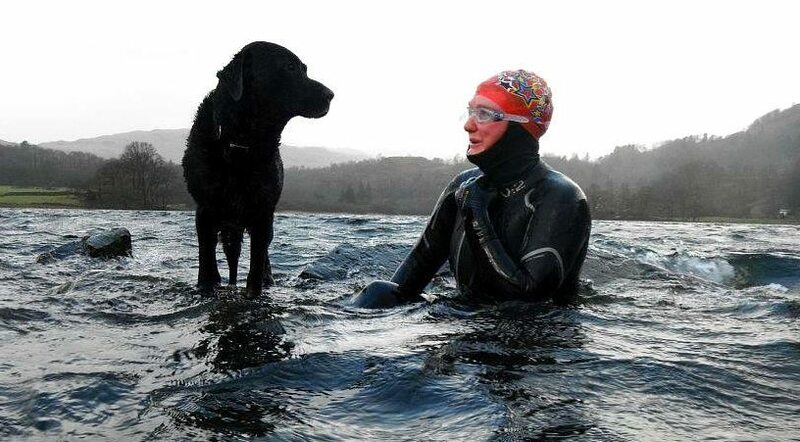 Are you wondering how you will be able to swim through very cold conditions and still come out smiling and safe? Cold water shock – the involuntary, sharp intakes of breath experienced when first getting in – dangerous if you are immersed at the time. Excruciating “ice-cream head” pain when first putting your head in the water as the cold sensitive nerves in the face and palate go into shock. Feeling a tightness in the chest and experiencing a shortness of breath. Accentuated dizziness when getting out of the water following a swim. Temperature “afterdrop” some minutes after a very cold swim which brings the onset of deep shivering. The effect of cooled peripheral blood returning to the core and/or the warm core rewarming the periphery. This is not intended to scare you off, far from it; to be forewarned is to be forearmed. These are all part of the winter swimming experience and last for a brief period of time relative to the wonderful experience of cold water swimming and the positive effects it has on your mood and enjoyment of swimming. I like to swim on my own in most situations but when I’m cold water swimming I always make sure I’m in good company; and by that I mean people who could actually get into the water and help me if I got into trouble, if they are not in with me already. It’s great to have someone else to help you pull your jacket on and zip you up when you are having a bit of a shiver post-swim. Ice swimming is a head game, as you are about to find out, and the support of other swimmers or club members is great for your safe enjoyment of the swim and for your motivation in general (particularly if you are meeting at the crack of dawn for a quick dip in the lake before work!). 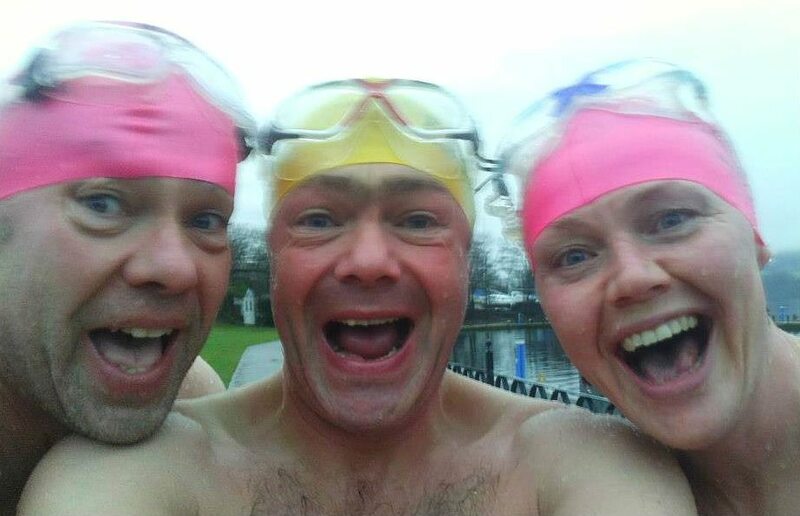 If you are looking for friendly winter swimming company in the Lakes, try asking in our social Facebook group “Lake District Open Water Swimmers” and you will usually get a positive response and someone to swim with. Warm Up. If you hit the water when you are already warm the experience is going to be a whole lot more enjoyable. Have a bit of a trot around the lake shore, or jump up and down for 10-15 minutes before your swim and you’ll not only generate heat, you will better prepare your body to deal with the shock of the cold water and exercise to follow. Get your Kit together. You can tell experienced ice swimmers by how well they set up their kit on the shore before their swim. After a cold swim you won’t be in the mood for fiddling with zips or buckles to open your bag, or dig to the bottom of your rucksack for that big fluffy changing robe. So have it all ready and to hand (or at least at the top of your bag) before you get in to prevent faffing when you really need to be getting warm dry kit on fast, before the shivers set in. Now is a good time to mention the dangers of peer pressure – Don’t let others push you into a skins swim when you don’t want to, or if you are not ready for it… wear what you want to swim in! Die hard winter swimmers are usually very acclimatized or have their own suit of bioprene to keep them warm (or a combination of both). Do your own thing and make sure you enjoy it. A Neoprene Swim Cap or two silicone swim caps work wonders. Neoprene gloves and socks are a lifesaver for those who really feel the cold in their extremities. A small Thermometer. Get to know how you react to gradually descending temperatures and how long you can safely remain in the water. Consider this an important piece of safety equipment. Getting in – Take your time but keep it moving. Don’t faff or dither about when getting in. Get the cold water shock response out of the way by gradually wading in, wetting your face and neck as you go. This is the only acceptable time when wild swimming to let a few choice swear words slip! Everyone has their own little routine when getting in but personally I prefer to wade slowly in and get my head down and swim steadily off as soon as possible, concentrating on calm breathing, smooth strokes and sucking up the pain from the head freeze. If the cold gets a bit much I’ll slip into a bit of breaststroke until my body balances out a little and I can begin to really enjoy the experience. Remember that your body is coping with a lot and is busy dealing with the physiological stress of cold water that is slowly leading you down the hypothermia path. Blood pressure and heart and respiration rate are ramped up already, so if you go off at your fastest mile pace you will come up short in a few yards, fighting for your breath and thinking you are having a heart attack. So, steady away until you are well into your groove. When it’s time to get out (when it stops being fun), get back into go-slow mode. Make like a seal and swim as far in to the shore as you can and sit/kneel up slowly to reduce the inevitable head spin. When you are ready slowly get up and out, step into your Crocs, slip into your Dryrobe and begin getting changed right now! Last winter I was unable to continue swimming into the winter for the first time in years. I went off to swim with a mate in February and I thought I was going to die – In my de-acclimatized state I just couldn’t function like I was used to. It was a good insight into how “normal swimmers” feel when I drag them down to the lake in the winter, extolling the virtues of ice swimming and telling them how much fun we’ll have (apologies to you all! 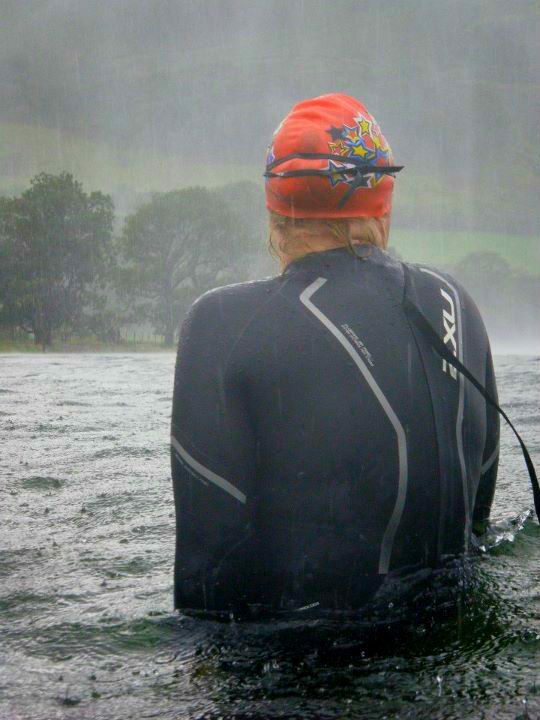 ), and how well adapted we can actually become with regular cold water swimming. The good news is that with regular cold water swimming (a few times a fortnight), you will eventually become very adapted to swimming in these conditions depending on individual physiology. The acclimatized swimmer still feels the initial pain of getting in but is more able to deal with the shock associated with it. The most pleasant way to do this is to just continue swimming into the autumn and then through the winter. It doesn’t take much to remain acclimatized – I think once a week is just about the minimum and it gives you a huge advantage in cold water. For the winter tarn dipper this means more fun and enjoyment and for the hard-core triathlete or ice-swimmer, increased performance and an edge over the competition. I hope you find these tips useful and get as much out of your winter swimming as I do. Remember to let common sense always be your guide and to swim for the sheer love of it. Come on in, the water’s lovely…!